To say that Klein has been “driven” in both his personal and college life seems like an ironically appropriate understatement. Now an ECC sophomore, Klein knows all about hard work. As a junior in high school, he and friend Tyler Fischer started their own swine vaccination business, B&T Vaccinating, in 2012. “We got business cards made, got out there and marketed ourselves a bit, and before long we were busier than we ever dreamed we’d be,” Klein explains. “I wrestled in high school so after class I’d go to wrestling, get home at 8 pm, and then go vaccinate pigs with Tyler until midnight. It’s a tough job that no one really wants to do, so we were busy. You’re bent at the waist catching baby pigs in 90+ degree heat, and you have to make sure you get each and every one of them. It’s really tedious, but if you have a good partner you trust and you’re both good at paying attention to details, it can be successful. “The older guys were glad to give us money to do it for them … we got good at schmoozing and built a large customer base,” he adds with a smile. Fischer left the business during their senior year of high school, and then Klein and new partner Michael Wolthuizen lost quite a few clients when they left home to attend Ellsworth Community College. 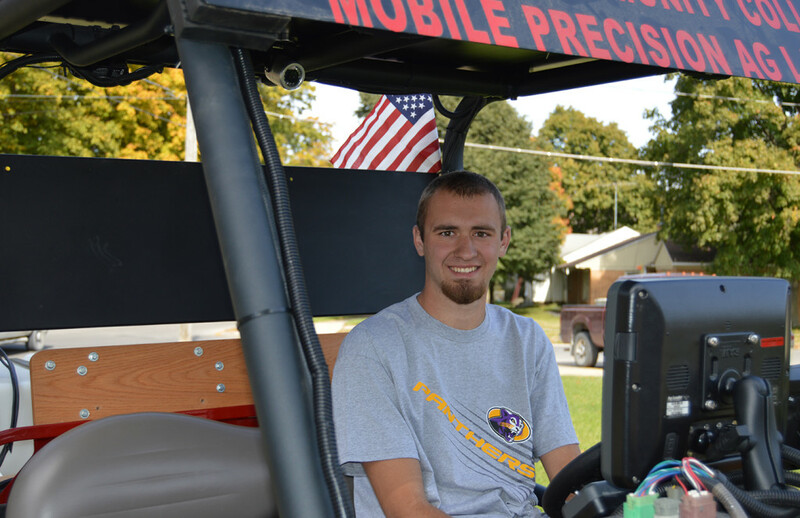 After graduation, Klein wants to go back to northwest Iowa and work at a co-op installing Geographical Information Systems (GIS) equipment, as well as helping with the family farm. Once his father retires, he hopes to take over the family farm operation. His current internship with the Stockdales and a second internship in the spring will prepare him well for those future plans. Klein is the son of Marv and Mary Klein of Sanborn; he has an older sister, Tristen, and two younger brothers, Rick and Todd. “Once I get back home I plan to spread the word about Ellsworth Community College,” Klein says enthusiastically. The faculty and staff at ECC have no doubts that he’ll do exactly that!